What I love: Ariel is in that curiosity phase where everything needs examined and explored. That means as a parent I have to ensure I am watching her very close and using as many safety precautions as I can to keep her safe during her learning. 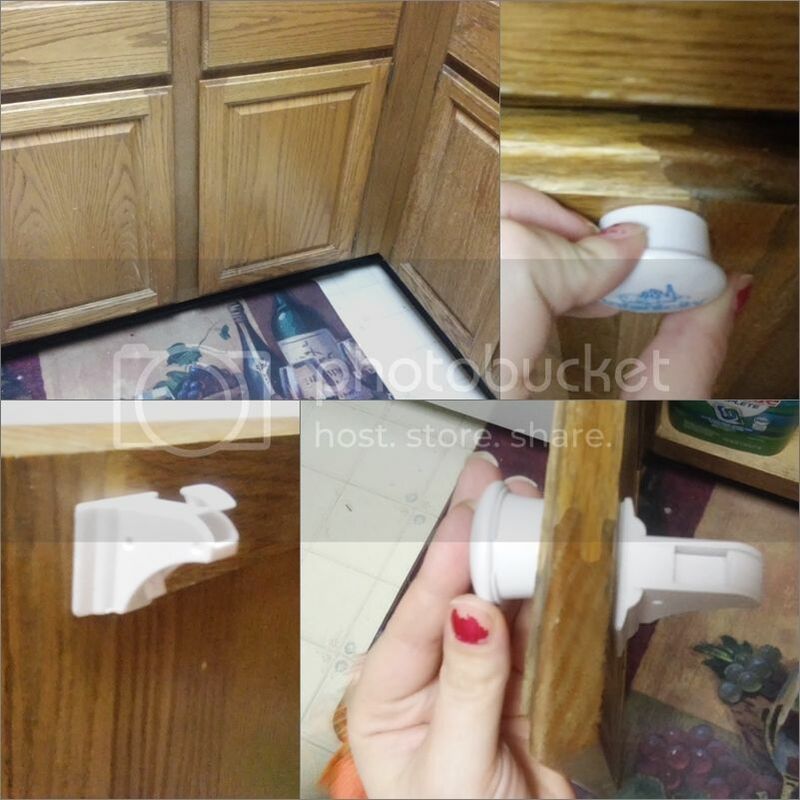 Cabinet locks are a really important part of that, whether it's chemicals under the sink or heavy dishes, bathroom cabinets, I want to make sure she can't get into things she shouldn't. When I was a kid they had these very hard strong latches that were screwed into the inside of the cabinet door and when you pulled the door it only came out about an inch, then you had to stick your finger in and push down with the force of life to open it. This led to more injuries for my Mom trying to get the cabinet open then it saved me from getting I'm pretty sure. They were tough for the user to open, ruined the cabinet doors and just were an all around pain. When I started to look for products to child proof our cabinets I knew exactly what I didn't want... any that even remotely resembled the ones from my childhood. Instead I wanted locks easy to use by everyone in the house yet safe for the baby. Infantcity Child Safety Cabinet Locks are a great solution! 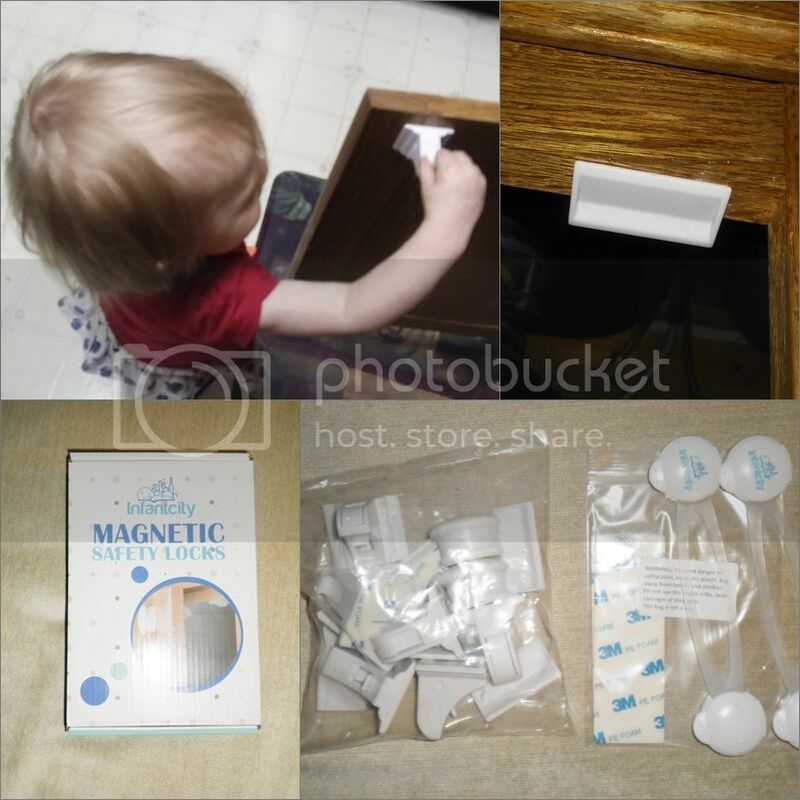 Each set comes with 6 Magnetic Cabinet Locks, 2 Matching Keys, 2 Multi-Purpose Safety Latches, 8 3M Adhesive Tapes (replacement for locks and latches), and an E-book that aides in keeping your child safe. These locks are super simple requiring no tools, screws or harm to your cabinets and drawers! It took me only minutes to set up. Using the including instructions it explains how to put the latches and locks best for your cabinet set up. Once I saw how they were suggesting to do it I removed the backing from the sticky and stuck each piece in place. Once I was positive I had it in the right spot and it was going to work right I pressed it down firm. It was instantly a powerful bond, resistant from little hands pulling open. From the outside of my cabinets it doesn't even look like anything is even there, but just press the magnetic key (which we keep the magnet stuck to our refrigerator) to the outside of the cabinet over the latch and it instantly unlocks. It also has a switch on the underside of the lock that you can flip to disable the locks. No worries when you're cooking dinner of having to unlock the cabinet over and over. Just disable while you're in the room and re-enable before you leave. These locks are fantastic. They are great quality and work better than expected. They also come in a really nice box which makes them perfect for giving as a gift to new parents or grandparents. I am super happy with these locks and highly recommend them!